The Benefits of Anaerobic Digestion | Renergy, Inc. Right now most organic waste – like food scraps – is being tossed into landfills where it releases harmful emissions into the environment. If we could anaerobically digest 50 percent of this waste, we could create enough clean energy to power 2.5 million homes for a year! But the benefits of anaerobic digestion don’t end there. Anaerobic digestion has big-time environmental value. Anaerobic digestion repurposes waste and keeps it out of landfills. Its process of breaking down organic materials produces two types of biogas: Methane and carbon dioxide, which are fully contained and never enter the atmosphere. The biogas is then converted into power, radiant heat and renewable natural gas. Captured biogas provides a clean, renewable energy source that’s returned to the local power grid as electricity, or compressed into renewable natural gas for the local pipeline. That means that your processed organic waste can be used to power everything from homes to cars. 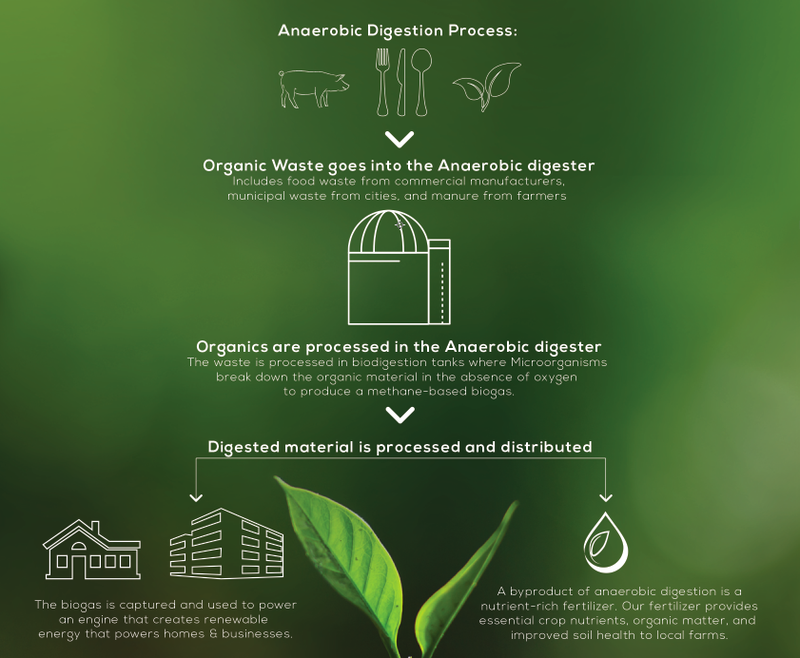 One type of organic waste that’s processed by anaerobic digestion is manure. Once digested, it becomes nutrient-dense fertilizer that is clean and safe to use on soil. Renergy will repurpose your agricultural, food, industrial or municipal waste and help reduce your carbon footprint. Contact us to get started!